I went for a wonderful hike on Lands End the other day. 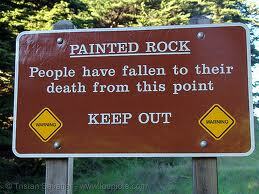 There is an area called Painted Rock Cliff. 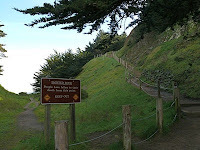 You may be able to tell from the photos that the trail goes up to the right and there is a stern warning not to go to the left with the quote "People have fallen to their death from this point. KEEP OUT"
Seems pretty clear, right? Why then did I witness a lone man standing beyond the sign perliously close to the edge, with his wife or lady friend simply looking on? I had to stop and poke my nose around. I mean, how could you not? Especially after what happened with my friend's boyfriend....Well, so it's official then. I'm on a case. You have to read more about it later...as I discover it. But tell me, why do you think that man was walking on the edge of the cliff? Ooooh, I'm intrigued...and he's crazy! Eeek, he must have a death wish. Good luck on your case. He probably figured he was safe because he's never yet fallen off a cliff and died. Ha, ha, Edna!! I'll bet his wife dared him. She may have prevented him from seeing the sign. Fat insurance policy? LOL! I love these thoughts. Erika - too funny - Edna! You know they say...always follow the money! This is the kind of thing that gives your spine the tinglies!! Some people like to live on the edge . . . .
Maybe he didn't believe people have fallen.